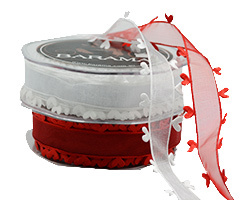 A very delicate organza ribbon with a satin heart along its' edge. 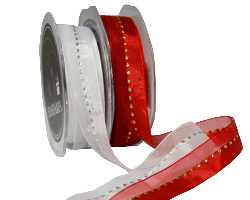 Available in white and red. 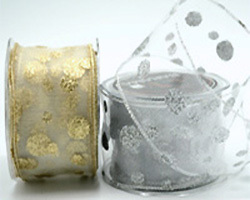 Sheer and delicate with a touch of bling. 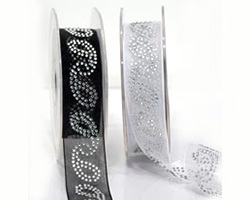 Brilliant diamentes on a sheer ribbon - very chic. 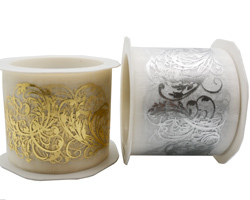 Available in Black/Silver and White/Silver. 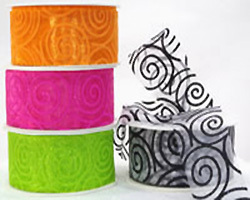 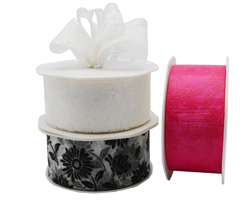 A delicate pattern, this pretty ribbon is available in the following colours: Ivory, Black, Chocolate, Moss and Hot Pink. 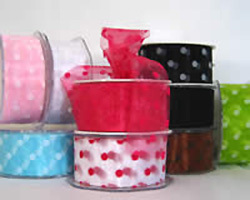 Available in Hot Pink, Pale Pink, Pale Blue, Green, White, White with Red, Chocolate, Black and Black with White. 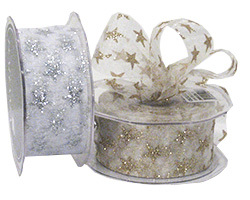 Cut edged organza in White with either Silver or Gold glitter stars. 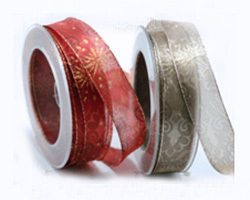 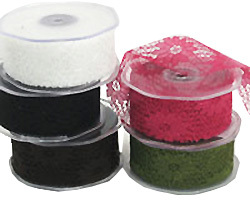 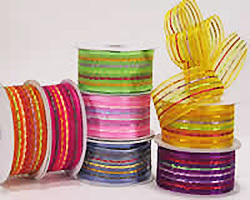 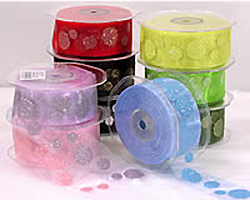 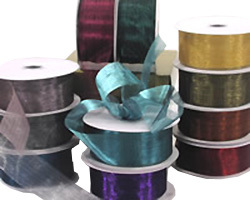 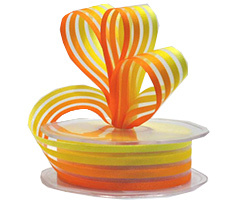 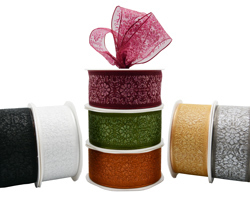 This ribbon gives the affordability of cut edge organza with the additional interest of a glimmer thread. 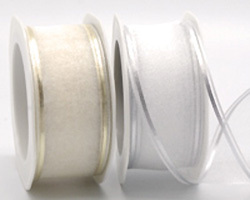 Sheer organza with a metallic and wire edge. 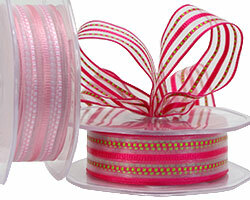 Perfect for creating a striking bow. 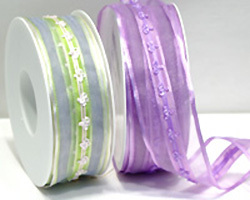 Sheer, delicate and very pretty, this wire edged ribbon is available in Lavender and Apple/Pink. 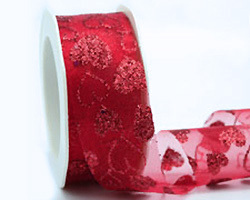 A cut edged organza with a glitter flower print. 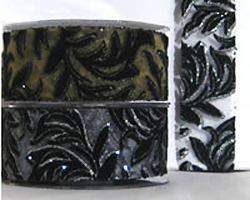 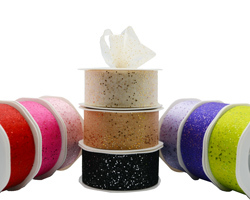 Available in Gold, Silver or Black glitter. 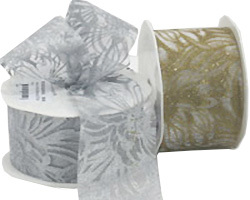 Soft cut edged organza with a floral, metallic print in Silver or Gold. 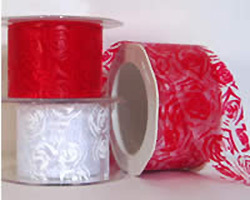 Available on White organza.